Sorry about the quality of the photo, its been around a long time, but I thought I would post it anyway.This is the first really big cake I ever did many years ago. The customer wanted to create a stunning focal point for the wedding reception. She also did not care what I did as long as it was large. Being excited by the possibility of doing a BIG cake I decided on the “Lady Windermere” style. Their were 8, 8″ cakes at the base, they surrounded a 14″round and going up there are a 12″, a 10″ and on top a 6″. 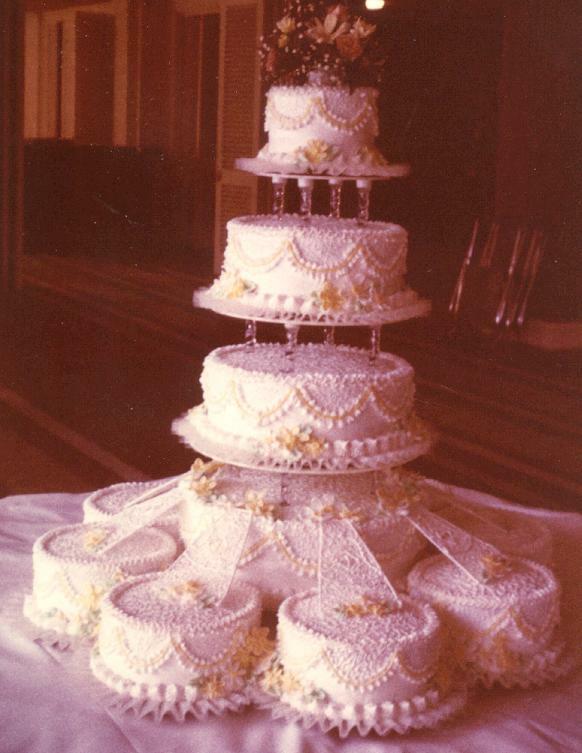 Designs included a ruffle drape, Cornelia lace, butter cream flowers with royal icing bridges that I made to connect the 8″ cakes to the 14″ to complete the cake. My customer loved the cake and I liked the way it turned out too. One of the most beautiful cakes I’ve ever seen! Love it!